This is taking information only from the APP and adding the names and dates to ONE file, of all of the Cousin’s to date. Round 1 I had capture in an EXCEL Spreadsheet, so I had the data, and Round 2 was the group (7) that were not in the first round. 12 of the 35 were in before I lost the list but have reappeared. I just finished entering the data for everyone, got the numbers that you see and had synced my database with my Online Tree. What was fun here, is watching Hints appear as I entered the date in my program, but then to look at the hints in the Online Tree. There is plenty of work to do, to prove how good this APP really is. I hope to track how well my Non-Facebook Cousin’s information is, vs the Facebook Cousins. From what I can tell, the Facebook Cousins information comes from THEIR Online Trees. Matching my tree with theirs to come up with the common ancestor. I am guessing that someone created online trees for the famous people. 22 of the 35 are Facebook cousins. My next task is to Document my own line, of one of the Famous Cousin’s then follow the information from the APP down to that cousin. I will be looking to prove or disprove the information from the APP, Names, and Dates. I will look to find one or two RECORDS for each item provided. Not a complete research, but to see how well this APP has worked. Based on the Data Error Report that my program provides, there are not many errors that appeared. The ones that I do have, are, for the most part, from my Facebook cousins. The really good news here, is that the APP has given me a number of Ancestors that I didn’t know about before. 20 of the Common Ancestors I have already, or one generation after what I already had, leaving 15 more lines that take me back further. 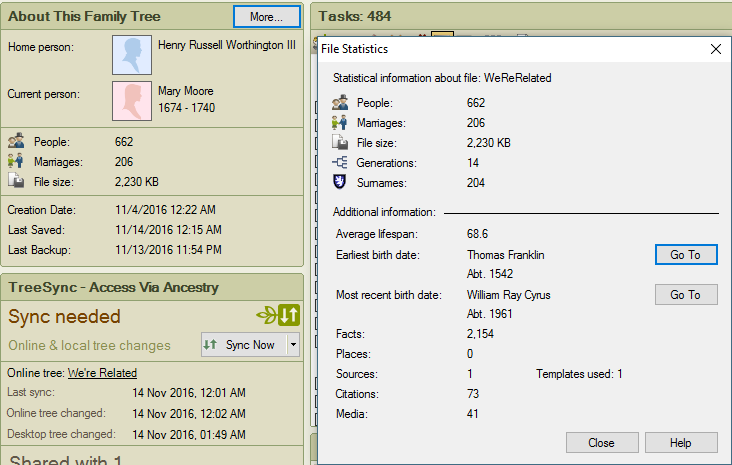 NOTE: As I write this, I should related that I have learned how to use the Ancestry search engine and the Value of the Shaky Leaf Hints. I almost come to rely on them. For this project, I am only going to use Shaky Leaf Hints. I am letting the Ancestry.com search engine FIND the records for me, then I will evaluate them to see if that hint is really mine. With 1,296 Record Hints waiting for me know, this should not be too difficult. This entry was posted on Monday, November 14th, 2016 at 2:52 am and is filed under Tools. You can follow any responses to this entry through the RSS 2.0 feed. You can leave a response, or trackback from your own site. Cousin Russ they just keep coming! Will try. Got some work cut out for me, but it is working.